January 21, 2010 (Rio de Janeiro, Brazil) - Iain Percy and Andrew "Bart" Simpson (GBR) were crowned 2010 Star World Champions today. The reigning Olympic Gold Medalists continue to add treasures to war chests. Percy's sterling collection of championship titles includes the 2002 Star World Championship and an Olympic Gold Medal in the Finn in 2000. 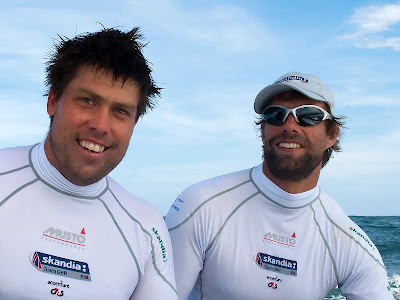 Percy and Simpson are in the TeamORIGIN afterguard and began sailing Stars together in 2007. 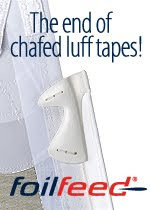 They were persistent in getting every ounce of boat speed out of their Mader Star and won the Olympic Gold Medal in the most exciting Medal Race of all of the Olympic Classes. While the wind was lighter during the final race of the 2010 Star World Championship, it was a nail biter nonetheless. Following the Olympics, they took a breather from Star sailing and have been doing a lot of match racing. Their last Star regatta was Sail for the Gold in Weymouth, where they won the Gold. They did not compete in the 2009 Star World Championship nor did they compete in the Taca Royal Thames and South American Championship earlier this season. They had two practice sessions leading up to this regatta. Percy commented at the pre-regatta press conference, "Sometimes short, sharp training sessions can work in your favor." Marazzi/DeMaria's doggedness in trying to close the point spread between them and Percy/Simpson during Race 5 kept the World Championship title up for grabs through the final race of the series. Percy went into the race, "holding all of the cards" and knowing that Marazzi/DeMaria would have a difficult time accomplishing two very difficult feats: placing first or second in the race and having the Brits finish eight or more points behind them. Percy/Simpson and Marazzi/DeMaria had an altercation during the starting sequence and Marazzi/DeMaria started to leeward of Percy/Simpson. "The start did not quite go as planned," explained Simpson. "We thought that we were pushing them to the wrong end of the line and a big shift came through in their favor. They did a great job." The Brits' miscalculation put the Swiss more than two dozen boats ahead of them at the top mark and trading places with Lars Grael and Ronald Seifert (BRA) and Johannes Polgar and Markus Koy (GER) and Fernando Echavarri and Fernando Rodrigues (ESP), all talented light air sailors. Said Percy, "We had a nervous moment at first when they crossed the fleet, but we continued to play the shifts and make gains." Mark Mendelblatt and John Von Schwarz led around the first windward mark. They, like many others, had problems with the current after tacking for the offset mark, they slipped back to fifth. On the run, "We jibed to get clear air, and it turned out to be a good decision," said Mendelblatt who went on to win his first race in a Star World Championship. He continued, "It was a good way to end the regatta." Percy/Simpson made a huge gain half way up the second beat and, "got quite close to them, and actually enjoyed the last lap," said Percy. In the end, Flavio Marazzi and Enrico DeMaria slipped from being in contention for first or second to 12th and Iain Percy and Andrew "Bart" Simpson had recovered to 16th place. 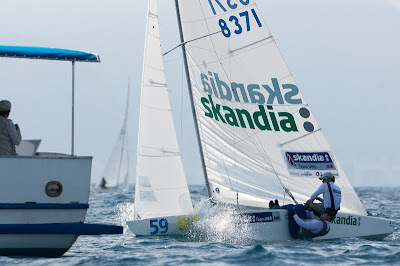 Peter Ficker and Urbirtran Oliviera (BRA) - The 1976 Olympic Silver Medalist in the Flying Dutchman teamed up with the 2005 Brazilian Star National Champion crew for this regatta and topped the group of eight Masters teams in the 2010 Star World Championship. They finished 38th overall.